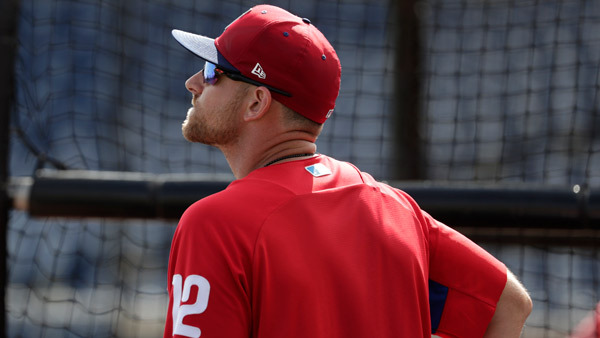 Veteran infielder Will Middlebrooks, playing on a minor league contract with the Philadelphia Phillies, suffered a broken left leg during Saturday's spring training game, manager Gabe Kapler told reporters. Playing third base, Middlebrooks was injured in the eighth inning when he drifted back while attempting to catch a pop fly. Left fielder Andrew Pullin was coming in on the ball, and Middlebrooks' ankle appeared to get caught underneath Pullin. Middlebrooks was attended to by trainers before leaving the field on a cart. Kapler said Sunday that Middlebrooks has a broken fibula and his ankle still needs further evaluation. No timetable has been given on Middlebrooks' recovery. Middlebrooks, 29, has played just 32 games in the majors the past two seasons, hitting .211 in 38 at-bats with the Texas Rangers in 2017. For his career, he is a .228 hitter with 43 homers and 155 RBIs. He agreed in December to a minor league contract with the Phillies and would get a one-year, $1.2 million deal if he is added to the 40-man major league roster.